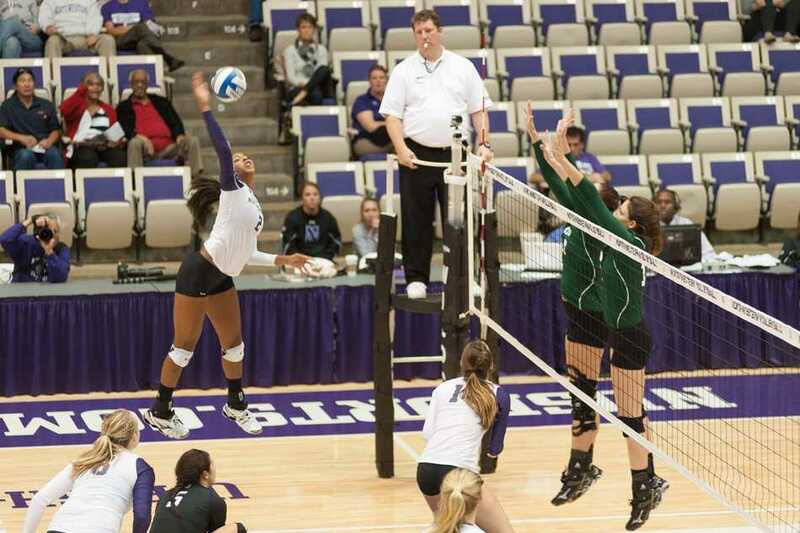 Freshman outside hitter Symone Abbott has been one of Northwestern’s best players and the Big Ten’s best freshman. Through 17 games, she leads the Wildcats with 209 kills. No. 22 Northwestern’s (13-4, Big Ten 3-3) road woes continued Saturday as the Wildcats lost to Ohio State (13-5, Big Ten 4-2) in four sets in Columbus, Ohio. The Wildcats are currently 1-3 on the season in other teams’ home arenas. NU got off to a slow start against the Buckeyes. This has become a trend for this Cats team. In the middle of the set, the Cats made untimely errors that opened the door for the Buckeyes. Ohio State capitalized on the NU mistakes, pulling away late in the set. The Cats rallied, but it was not enough to overcome the deficit. Northwestern gave away the first set 21-25. In the second set, coach Keylor Chan brought in back-up setter sophomore Caleigh Ryan. Ryan entered the match for only the sixth time this season after setting for the Cats last season. Ryan jumped right in and ran the system very well. The Cats racked up three straight points, all by senior Yewande Akanbi. Errors once again plagued the Cats at the end of the second set. With a 23-21 lead NU suffered an error that gave the momentum back to OSU. The Cats still had the opportunity to win the set while up 24-23 before a crippling service error by redshirt junior Caroline Niedospial. The Buckeyes followed the error with 2 points that included a big block by sophomore Taylor Sandbothe. The Cats dropped the set 24-26. In the first and second sets combined, NU had more kills than OSU but accumulated 5 errors. The Cats came out of the break re-energized. NU cleaned up their game in the third set and took command of the set quickly. Redshirt senior Katie Dutchman turned it up another level. Dutchman had 10 kills and no attack errors through three sets. The third set was all Cats. NU pulled away and kept the lead this time around. The tempo of the offense was fast-paced, and Ryan’s impact was evident. The Cats won the set 25-17. After opening the fourth set down 2-5, Chan reinserted freshman setter Taylor Tashima, despite Ryan’s strong play. The substitution did not have the same effect on the Cats offense as the change during the second set. It did not take long before Chan went back to Ryan at setter. No matter which setter the Cats went with, they could not stop the Buckeye attack. The lead grew to 17-9 before an NU timeout. The Cats ran out of steam in the fourth set. NU surrendered the set 17-25, ending the match in four sets 21-25, 24-26, 25-17, 17-25. No. 22 Northwestern joined No. 9 Nebraska and No. 11 Illinois as ranked victims of OSU. NU heads to Nebraska on Wednesday to take on the No. 9 Cornhuskers in the third game on the current road trip.